The winner the previous week in Hong Kong, Wang Manyu repeated the feat on home soil at the Seamaster 2018 ITTF World Tour Platinum Kaisa China Open in Shenzhen on Sunday 3rd June. Maintaining the form displayed in the Queen Elizabeth Stadium, in the Bo’an Stadium, the no.4 seed, she beat colleague and defending champion Ding Ning, the no.9 seed to secure the title (13-11, 9-11, 9-11, 11-9, 11-8, 9-11, 11-5). Undoubtedly, the opening game for Wang Manyu was a test of nerve, she passed the test. She led 10-6, Ding Ning reduced the arrears to 10-9; Wang Manyu called “Time Out” but Ding Ning levelled and then at 12-11 held game point. A lesser player may have panicked, not Wang Manyu, playing against one of the mentally strongest opponents on planet earth, she won the next three points to seize the early advantage. Success by a narrow margin in the opening game, it was exactly the same in the second, only this time for Ding Ning. Changing the pace and degrees of spin, Ding Ning led 10-5; Wang Manyu won the next four points, Ding Ning called “Time Out”. The break worked, Ding Ning won the next point; it was parity. Notably both players had elected for “Time Out” when their opponent was serving; perhaps not always recommended as you are not necessarily able to dictate the play. Close opening games, the third and fourth were no different with honours shared, the former to Ding Ning, the latter to Wang Manyu, after Ding Ning had recovered from 5-9 in arrears to level matters. True to the tradition of the contest, the fifth game was an equally close affair; at 8-all matters were level; Wang Manyu, resolute, won the next three points she held a one game lead. Success in the fifth game, in the sixth Wang Manyu seized the advantage, she won the first three points; determined true to her character, Ding Ning levelled at 7-all, then trailed 8-9 before winning the next three points to seal the game. A deciding seventh game beckoned; at the change of ends, Wang Manyu led 5-3; the advantage was never relinquished. At 10-5 she held five match points; she succeeded at the first attempt. It was for Wang Manyu her fourth Seamaster 2018 ITTF World Tour Women’s Singles final of the year; it was her third success. In addition to last week in Hong Kong, previously she had won in Hungary, having in March been the runner up in Qatar. In total it was her seventh career such final, the fourth time, the winner. 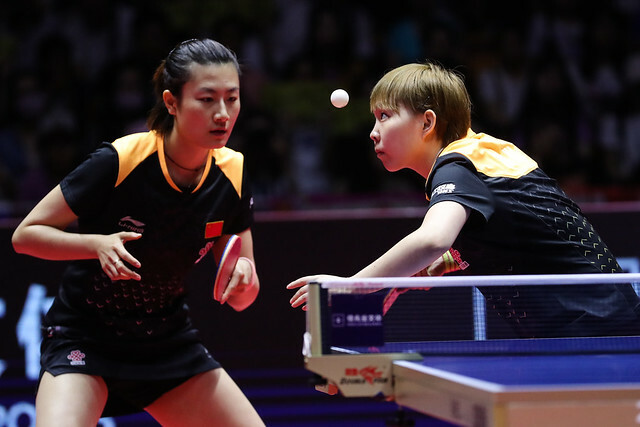 Conversely for Ding Ning it was the fourth occasion and three in a row that she had appeared in an ITTF World Tour Women’s Singles final in China; all previous occasions being in Chengdu. She had won in 2016 and 2017 as well as four years ago in 2014. Overall it was her 25th such final; she has now been the runner up on 12 occasions.